An effort to encourage collaboration among ASEAN startups and promote multi-sector innovation approaches to resilient recovery. MANILA, Philippines – QBO Innovation Hub (QBO), the Philippines’ public-private initiative for startups, in partnership with the United Nations Development Programme (UNDP), the Philippine Disaster Resilience Foundation (PDRF), and the Department of Trade and Industry (DTI) has announced STARTUPS TO THE RESQUE, an ASEAN wide startup competition to develop the best innovation solutions related to disaster resilience and recovery to be held during DTI’s annual Slingshot event on October 20, 2017, at the Philippine International Convention Center (PICC). This challenge empowers startups from across the region to come up with ways to use their existing products, services, and business models to form creative solutions to pressing global issues, including environmental disasters, outbreaks/pandemics, or violence and conflict. The Slingshot ASEAN event also provides a platform for startups to network, build regional market access, and gain international exposure. The first prize winner will receive $10,000; second prize winner will receive $4,000, and third prize winner will receive $2,000. 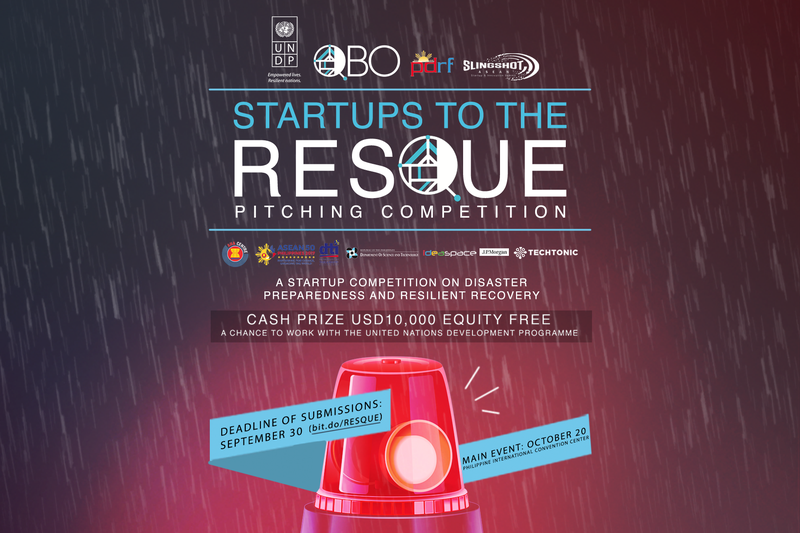 Scores are based on both the innovativeness and feasibility of a startup’s idea, and those with the most promising solutions will have the opportunity to work with the UNDP and deploy their solutions with PDRF, one of the world’s leading private sector disaster resilience consortia comprised of the Philippines’ top corporations. 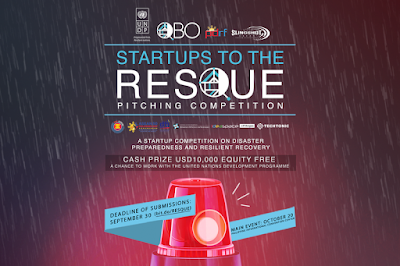 More than just a competition, STARTUPS TO THE RESQUE promotes awareness on the different crises faced by ASEAN countries – like the devastating typhoon Haiyan that ravaged Tacloban or the current armed conflict happening in Marawi – and inspires startups to play a more proactive role in preventing and mitigating these disasters. From the applications, 20 startups will be selected to participate and showcase their ideas at the SLINGSHOT ASEAN event, from which the top 6 finalists will be invited to pitch on stage. The top 3 startups with the best pitches will be selected as winners. Deadline for submissions is on Sept. 30, 2017. QBO (‘ku-bo’) is an innovation hub or a platform for the startup community to collaborate, develop talent, and grow. It provides startups with support and resources through events and capacity building programs as well as focused interventions designed to improve access to markets, knowledge, capital, and talent. QBO is the country’s first public-private initiative for startups, created through a partnership between IdeaSpace, J.P. Morgan, DOST, and DTI. Spurred on by the vision of Filipinos startups changing the world, QBO’s mission is to create a globally competitive startup ecosystem in the Philippines. The United Nations Development Programme (UNDP) works in about 170 countries, helping to achieve the eradication of poverty and the reduction of inequalities and exclusion. It helps countries to develop policies, leadership skills, partnering abilities, institutional capabilities and build resilience in order to sustain development results.